Fully waterproof and breathable chainsaw protective boot with Class 2 protection (24m/s), at a very cost effective price point. Cold and wet feet are the last thing you need when out using your chainsaw, and now thanks to the waterproof and breathable lining in the TH12, your feet can stay warm and dry. A steel toecap; anti-perforation midsole, and Class 2 chainsaw barrier ensure that you stay safe, and the lightweight injection moulded polyurethane sole unit is lightweight, flexible and slip resistant. Although the TH12 Extreme is a lot less expensive than some other waterproof chainsaw footwear, it is by no means a "cheap" boot. With durable scuff resistant leather upper and Cordura® padded collar and tongue, it is built for work, and the laminated textile and membrane lining is comfortable, moisture wicking, breathable (and 100% waterproof!). 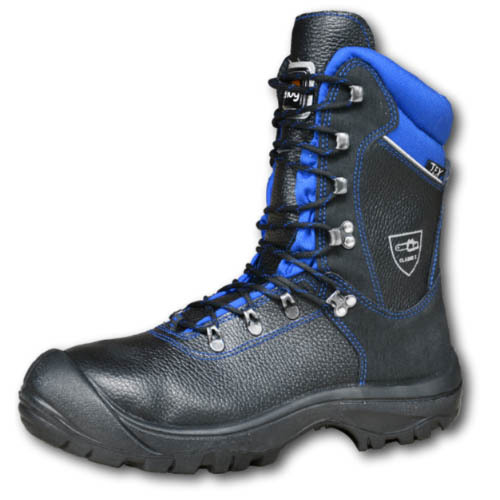 A more comfortable waterproof chainsaw boot at this price is hard to find.